Nick woos Brooke. Ridge & Nick continue to fight. Massimo tries to keep his family together and happy. Stephanie tries to turn Eric even more against Jackie, who moves into Mass' place. Jackie & Mass are still happy. 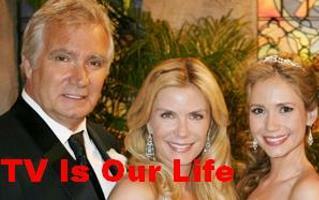 Brooke & Macy have a cat fight about Deacon, his kids, and her involvement in all their lives. Rick & Amber decide the best way to fight Deacon is court! They talk to their lawyer about how he let them down. They all get ready for court. Sally's behind Macy's plot. Spectra is still going downhill while Forrester's is flourishing. Thorne & Darla get closer. He asks her to marry him. She accepts. Jackie doesn't accept Mass' proposal 'cause she thinks he's rushing things. He isn't going to give up on her, and neither is Eric. Ridge continues to fight for Brooke also, who doesn't accept his proposal. Nick stops at nothing to charm Brooke, including singing one of his romantic songs. I think it'll be "All I Need". Ridge's kids love Mass even more now. Bridget tells Brooke again she shouldn't be dating the 2 brothers. Stephanie is told about the siblings and once again thinks Brooke is no good 'cause of what she's doing. Deacon fights hard for his kids but his parents don't make it easy. Macy wants to help to get revenge on Brooke and 'cause what Deacon's doing is right! She doesn't listen to Sally on this one. Nick, Jackie & Mass will continue to draw closer together. Ridge tells Brooke about Nick being his brother. She goes to talk to Nick about this. Jackie goes home almost completely better. Mass & Eric both want to take care of her but they have confrontations. Ridge & Nick try to get along since they know the truth, but will continue to fight for Brooke. Stephanie tries to get Eric back more now since Mass wants Jackie. She finds the news of Mass & Jackie's past stunning. All other close parties of the Marone & Payne's will also find the news shocking. Stephanie doesn't doesn't like her. Macy hounds Deacon about fighting for custody of his kids. Brooke is still uneasy about him and Hope together. Ridge tries to make peace with Rick & Brooke. Amber still sides with Deacon concerning Little Eric & Hope. Darla & Thorne are still upset about Macy's decision (for divorce), but will draw closer 'cause of the baby. Sally continues to talk trash about Thorne. Macy will never trust them two again. Ridge continues to fight for Brooke. Nick charms her even more. She's slowly forgetting about Ridge. Bridget is a little heart-broken still about Ridge saying they can't be together, but she knows it's for the best. Deacon & Macy fight to see his kids cause she wants to get revenge against Brooke for her affair with Thorne, who wants her back. Amber wants to give Deacon time with Little Eric, but she's still fighting with Rick about it. Sally's not too happy about Deacon & Macy's fight for him to see his kids, but Macy's so stubborn she's not going to give up. Macy starts her singing career soon. Stephanie fights for Eric, who gets closer as a friend to Jackie the more Stephanie's in a battle with him. Darla's caught between a "rock and a hard place" with Thorne and her baby cause of his love for Macy. Ridge's kids tell their father they miss Bridget. Clarke continues to be a good friend to Darla. Here comes this new hunk....Dominick - someone to give Ridge a run for his money in business and in love. It would seem obvious to pair Dominick up with the spread easy likes of Brooke ! But, wait......it seems that maybe he has more of a head on his shoulders than Ridge.... .(his half brother...... hehehehe) As things get all twisted and mangled and Ridge's jealousy takes hold, Brooke will start to fall for Dominick. But, Dominick is too smart to want a has been, used up dim-wit like Brooke. He falls for someone fresher, younger and smarter. Yes, that is right, he goes for Bridget. This makes Ridge furious as he watches Bridgette fall for the smarter, better tressed and better looking Dominick. Ridge then goes boo-hooing to Brooke. But, when Brooke realizes that Bridget has won again, she goes into a rage, tells Ridge to take a hike and falls in the arms of yet, some other "love of her life". Bridget and Ridge are heating up, but how long will this little love connection last ,and how far will it go?? A few seasoned viewers may recall how Sheila's dastardly deed may come back to haunt these lovebirds. Some may remember that Sheila was trying to manipulate the outcome of Bridgette's paternity by going into the lab and switching Eric and Ridge's blood samples. ( Yes, that is right. The lovely Brooke had bedded down both Eric and Ridge within the same fertile month (YUCK !!) and the question of who was Bridget's father came into question). It was in Sheila's best interest if it turned out to be Eric. But, as far as I can recall, we never found out if she switched the samples or let them alone. This means that Ridge could after all be Bridgette's father. (Ew-w-w-w !!) At least that is how I remember this story line. The family remembers that Sheila was handling Bridget’s paternity test when she was a little girl. Sheila had trouble fudging the results as she was interrupted at the time and lost track of whose sample was whose. It came out that Bridget was Eric’s daughter but we don’t really know for sure if that is true as Sheila had her hand in it. I think Mass and Deacon will team up to get Brooke out of Ridge's life. I'm not sure how, but I guess some blackmail will come into play. Will Ridge's true paternity come out? Yep. We have been working up to this for what like a year and a half? This is almost Bill Bell style with the paternity thing. What else, oh yeah the truth about Brooke's affair will come out too. I know Mass is dying to tell Ridge both of the secrets. I don't think Ridge and Bridget will get together. I think this is just a reason to get Bridget a little more involved in the storyline with Brooke. I know Bradley Bell doesn't want to go there at all. After all, the audience is supposed to more conservative. After everyone finds out about Ridge's paternity, all hell will break loose. The kids will spend more time with Massimo. Eric will distance himself from Stephanie. I've heard, though I guess it could be wrong, that an old flame of Amber's will come into play and will stir things up for the couple. I don't know why we're going to see this same old storyline again. I think CJ and Bridget will intimately stay together. Maybe Mark will find someone a little more suited for his age. Well, I predict Thorne and Macy will get back together, but it may not be that simple, when you throw Lorenzo and Tricia into the mix. Maybe Lorenzo will come back to LA with Macy and some kind of weird love quadrilateral will emerge. Or maybe, Macy will just dump Lorenzo and shack up with Thorne. Once the Forrester family finds out that Macy is alive, they will be hot as fire that she could do that, but in the end they will forgive her absence and welcome her back. Something is going to happen with the Mark Maclaine side of things. I hear that Tippie Hedren is coming back as Margo and Jake's mom is coming back to the show. Margo won't be because Lauren Koslow is still on Days. Maybe Mark will learn more about his family? I'm not sure about this because he lived with his mom so you would think she would have had access to the other Maclaine family members. Okay, Ridge and Brooke are not going to get married. That just seems too easy and too obvious. Maybe they'll court, or maybe it won't work out. I don't think Deacon will interfere in the near future. Perhaps he'll take Eric's advice and wait and see what happens. Of course if Brooke and Ridge get closer, Deacon may become impatient and start causing some problems. Bridget will hold on to the secret of Ridge's paternity for her father and "brother's" sake. I think she will continue to test the water with the two Garrison men, however, her plate seems full with Ridge and the kids and her pre-med program. Stephanie and Eric will "remarry" in the coming weeks. Perhaps Clarke and Sally might strike up a romance. They've been spending a lot of quality time together as well sharing a kiss, well at least one big one. Sally will have some health issues that might influence Macy in her decision to come home.